Includes multiple Theremax 'controllers' and a P9700S. "Synthecycletron by Barry Prophet is now open to the public and will be for the month of November, returning next Spring to be a seasonally permanent installation. You are invited to an informal gathering at the sculpture site on Toronto Islands, Saturday Nov.3. We will be taking the 1:30pm Wards Island Ferry and walking to Centre (approx. 20min.). 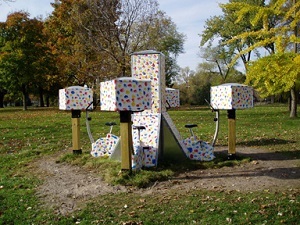 This cycle powered electronic sound sculpture commissioned by New Adventures in Sound Art (http://www.naisa.ca) is located south of the boat rental and east of the bike rental just north of the south shore."